The 10 local artists selected for the 2018 MetroScapes program couldn’t be more different, but they share one thing in common: excitement that their creations will be viewed by thousands of people and a desire that those individuals will be moved by what they see. Now in its 4th year, MetroScapes is a public transit art program that showcases local art at Metro transit locations. This year’s winning artists are the most diverse group since the program began. 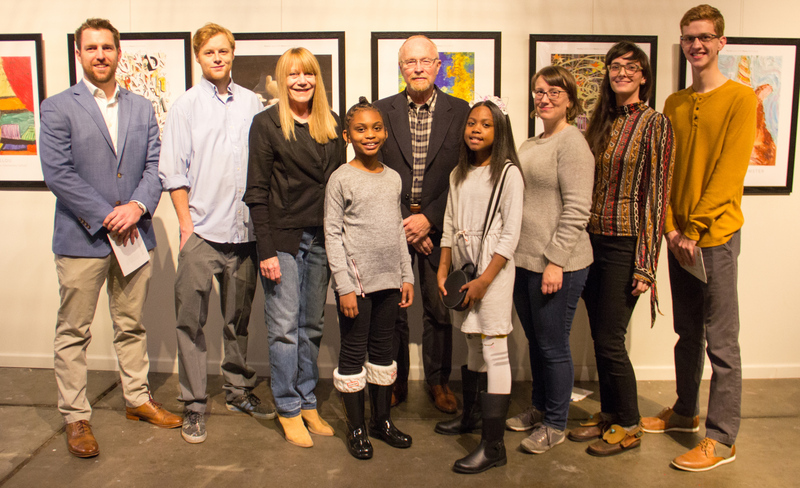 Chosen from a pool of 175 submissions, the winners range from a 4th and 5th grader from Jefferson Elementary School in North St. Louis, to a high school senior from Union, Mo., a retiree from Washington, Mo., and six others whose experience as artists range from less than one year to decades. David Allen, Director of Metro Arts in Transit and one of the jurors on a panel of artists and art professionals that selected the 10 winners, noted that he really loves the variety among the 10 pieces ultimately selected this year after a diligent review process. Those surprises come in many forms this year, starting with Cakes, created by Eliyah Grimes-Jackson, a 4th grader at Jefferson Elementary School who has been drawing since she was just one-year old. When asked where she got the inspiration for her colorful artwork that makes viewers hungry for a little something sweet, she said it came from a book her art teacher told the class to look through, and she came upon one of cakes. “I was like, ooh, I should do this, because almost everybody in the world likes cakes,” Eliyah said. Her teacher, Theresa Hopkins, submitted that piece for this year’s contest, along with 11 other images created by students from her art academy, and one of her own. She was thrilled to learn that Maya Angelou, a vibrantly colored portrait of the American poet, singer and civil rights activist created by 5th grader Tyler Carlis, had also been selected. “I’m really proud of them. For them to win something this huge, in an adult competition, that’s what’s going to hook them. You can’t tell them they are not artists,” Hopkins said. As for what she wants them to get out of this experience, Hopkins added she hopes it’s the hunger to not ever let it go. Samuel Avery (St. Louis), whose piece Can’t Stop, Won’t Stop features a vivid Koi fish, celebrating the resiliency of the Koi, which is known for swimming upstream against all odds, even being known to swim up waterfalls as if no mission is impossible. Noah Ennis (Union, Mo. ), a senior at St. Francis Borgia High School in Washington, Mo., whose canvas Sandy Shores incorporates color in a way that creates a great sense of movement. Ennis only began painting in March of this year. Tim Judge (Washington, Mo. ), whose submission Sunflowers will bring a sunny smile to faces of many transit riders. Judge has painted for many years, but only got serious about his art after he retired in 2015. 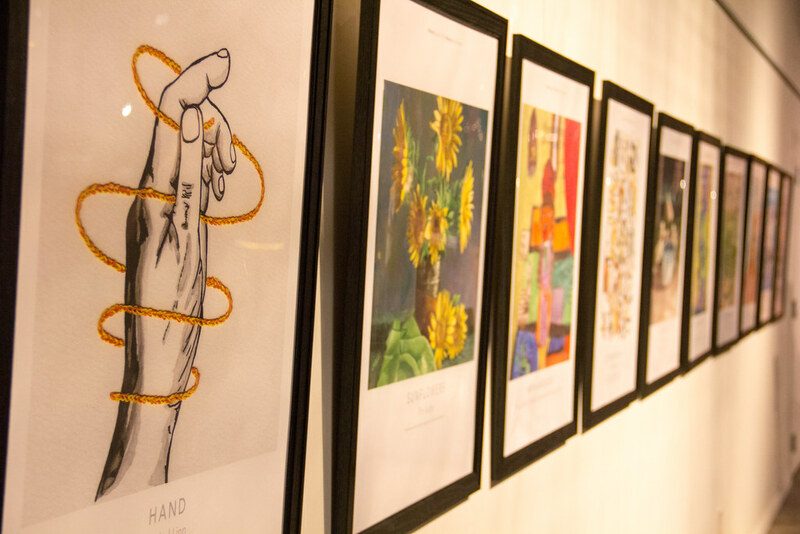 Rachel Linn (St. Louis), whose drawing Hand is the first piece she’s ever had in an art show, and underscores the importance of the role our hands have in everything from daily tasks and communication to affection and art. Joyce McClain (Barnhart, Mo. ), who is a two-time winner in the MetroScapes program, and painstakingly created Ducklings, replicating an image in a photograph using water soluble oils to create the life-like baby ducks with feathers viewers will almost want to touch. Rosa Nevarez (St. Louis), also a two-time winner of the MetroScapes contest, who captured the honor this year with Happy Party Hamster, a whimsical piece that is sure to delight. Erik Thompson (Wildwood, Mo. ), whose Letter Bending 1 is part of a series exploring the art of text and reflects Thompson’s interest in literacy and penmanship in the modern digital age. MetroScapes is supported by funding from the Regional Arts Commission.